1930s Paris was a hothouse of creativity and novelty. Jean Schlumberger, a charismatic young man from a wealthy family, fit right in with the avant-garde fashion and art crowd. He began making audacious costume jewels from antique chandeliers, giving them as gifts to his elite and stylish friends. In 1937, couturier Elsa Schiaperelli discovered his playful creations and commissioned him to make jewelry and buttons for her collections. The collaboration was a huge success, but in 1939, with the outbreak of World War II, Schlumberger joined the army. By 1946, Schlumberger had survived the Battle of Dunkirk, the war had ended and he yearned to return to a world of beauty and creativity. He opened a salon in New York, where he designed jewels as fantastical as his earlier creations—but now, with precious metals and gemstones. Without formal European design training, Schlumberger was unbound by rules, with the freedom to let his imagination run wild. His vivid, three-dimensional pieces captured the spontaneity of swaying leaves, flying birds and leaping fish. He chose gemstones purely for their color and beauty, not their value (“One might as well pin a check on someone’s lapel,” he said). Nevertheless, his creations were expensive—and just strange enough to appeal to confident women with a hint of a rebellious streak. In 1956, Schlumberger joined Tiffany & Co. as the first designer allowed to sign his work, and remained there until his retirement in the 1970s. 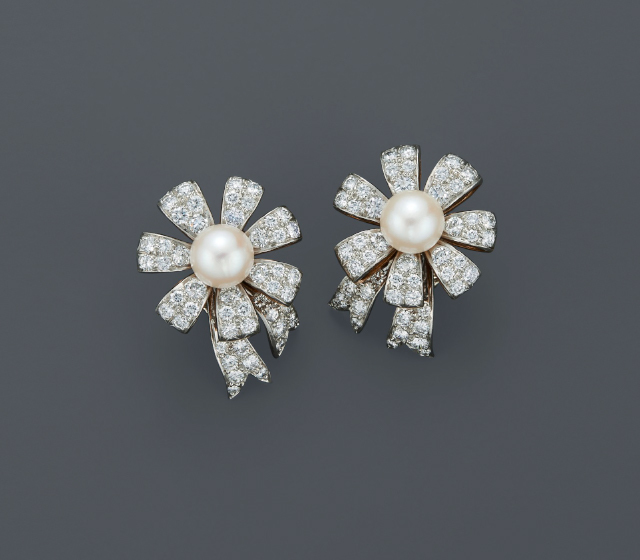 In 1958, he was the first jewelry designer to win the Fashion Critics’ Coty Award. He also won the devotion of a glittering roster of clients, including Millicent Rogers, Bunny Mellon, Babe Paley, Greta Garbo, Gloria Vanderbilt, Elizabeth Taylor and Audrey Hepburn. Schlumberger revived the 19th century art of paillonné enamel, layering melted glass over 18k gold leaf to produce a luminous effect. He used the technique in brilliant enamel bangles that became must-haves for the fashion and society set. Jacqueline Kennedy wore them so often they became known as “Jackie bracelets.” Another of his celebrated designs is the Bird on a Rock brooch, first fashioned in 1961 for a large topaz, and later recreated for the renowned 128.54 carat Tiffany Yellow Diamond. Despite being surrounded by opulence, Schlumberger got his biggest thrill from nature.